Photo courtesy of BoingBoing. Used without permission. We had two more weeks before school started. 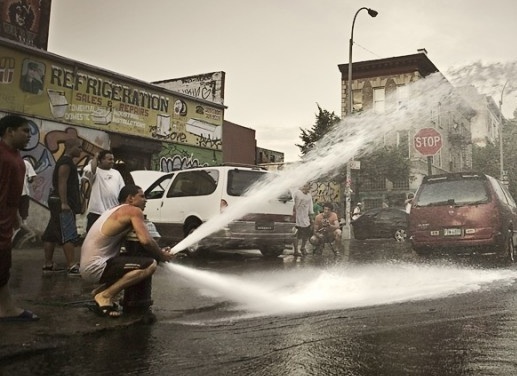 That summer was very hot, but every day on our block they had the Johnny Pump on. The Johnny Pump was when the hydrant was on full blast. All the kids would run through the blast of cold water. We didn’t need a rio. We didn’t need a pool. If the Johnny Pump was on too long, our water upstairs would turn brown. I didn’t mind. It wasn’t like I took a bath every day. We all knew we were not supposed to have the Johnny Pump on. Every once in a while the firetruck would come by and a fireman would come out and shut off the pump. We would stand around, wet and sad that the firemen were stopping our fun, but we also knew someone could get in trouble. The fireman had given Caesar, the man who owned the nicest house on the block, a sprinkler cap, and he would put it on like you were supposed to. The sprinkler was okay, but it was like a little rain instead of a big storm. The sprinkler was only supposed to be for a little while, too. Then the Sun would take over, and cook the block, turning the black street gray, and making it hurt to walk with thin sneakers. But then, in the middle of the afternoon or the middle of the night, one of the men from the block would come out with a big monkey wrench. He would take off the cap and it would hit the street with a metal sound. And then he would turn on the pump with a creaking sound you could hear up and down the block. Then the water would come. First it was a trickle and then the cool water would blast out of the hydrant and turn the black, dry street wet and shiny. Some kid would get a can and rub and rub and rub it on the sidewalk until the top and then the bottom of the can fell off. Then they would hold the can to the opening of the hydrant and be able to spray everyone with more force. The water could almost push you across the whole street. Cars would come by and whoever had the can could wet the whole car. Sometimes Papi would drive his car by slowly so he could give it a quick wash. In our apartment it was always hot in the summer. We had what Papi called Puerto Rican air conditioners—“An open window.” We had screens to keep out the mosquitoes and let in the air, but the apartment was still hot. One morning, when it was really, really hot, none of us had slept all night. Fever saw that the pump was still on from the night before. It was not a full Johnny Pump but it was still going pretty strong, and nobody was outside yet. We asked Mami if we could go and she said, “Yes,” and we got into our shorts and ran down before we even had breakfast. No one was in the street, so we had the pump all to our elves. Mami even came down and put her feet in the water. I was thinking, This was better than a river in Puerto Rico, better than any old pool, because this was home, this was home. And then I slipped on the street and cut my leg really bad with a piece of broken glass from a beer bottle. I’m from Brooklyn and man does this story bring back some very fond memories. The coffee can used to direct the stream of water, cars driving slowly by in both directions to score a free car wash, all of it. Thanks for the memory. De nada. Thanks for reading! Thank you for the wonderful memories. I also come from Los Sures (Keap Street), right by the old (E.D.) Eastern District on Division Ave. Brother what memories. I wish my children and nieces, nephews could have enjoyed this special thing called Nuyorican gotta smile. Que’ Dios Te Bendiga…..
Papote! My pleasure! Please keep on reading. A lot of my work, not just this, has to do with Los Sures. Look for more soon!